What are the influential books from your childhood? Those books that paved the way to a lifelong love of reading and for me, eventually to fall in love with writing itself. What a treat for me to find a hidden article written by one of my favorite authors. A piece of writing that reminds me of my early days as a reader and provides insight for my professional life today. The article is titled, “How Do People Get New Ideas?” The author is Isaac Asimov, one of the giants of science fiction writing. I remember reading The Foundation Series for extra credit in high school physics needing to read only the first volume and not stopping until I read the full set of books. His series of I, Robot books also sparked my imagination so many years ago. 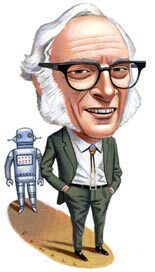 In 1959 Isaac Asimov briefly joined a think tank in Boston, working with other scientists concerned with improving various elements of national defense during the heart of the Cold War. He did not stay with the group, but did contribute an article for their review. He wrote on creativity and how to best tap into new ideas. The article was never published until now, 55 years later. It is an amazing article and I invite you to read it for yourself (Link Here). His advice is not dated at all and would fit in nicely written today and appearing in an innovative magazine such as Fast Company. He speaks of the traits of an individual who has the ability to think outside the box and how best to bring people together to generate ideas. Wisely he notes that each person needs private time – even isolation to think and create. Only then do we gather to pull our ideas together. He further talks about the ideal size of a creative group (small at 5) and how to watch out for loud personalities dominating conversations. Often we miss how important a facilitator is to the process. Isaac Asimov speaks to this too using the language and references of 1959, but still relevant today. “I do not think that cerebration sessions can be left unguided. There must be someone in charge who plays a role equivalent to that of a psychoanalyst. A psychoanalyst, as I understand it, by asking the right questions (and except for that interfering as little as possible), gets the patient himself to discuss his past life in such a way as to elicit new understanding of it in his own eyes. My muse must have pointed me to this article. Reading it took me back to reading and exploring my imagination as a kid. The article also holds meaning for me today professionally as I will continue to work with people ever creating.